Defeat the giant spiders and escape the perils of Mirkwood™ Forest! Follow Fili the Dwarf and Kili the Dwarf deep into the dark and scary Mirkwood™ Forest on The Quest for The Lonely Mountain. Attack the heroes with 3 small spiders and 2 giant spiders with glow-in-the-dark eyes and trap them inside cocoon elements high up in the buildable tree. Use Legolas Greenleaf™ and Tauriel™ to save the day by battling the spiders and freeing the Dwarves with the tipping function before it’s too late! 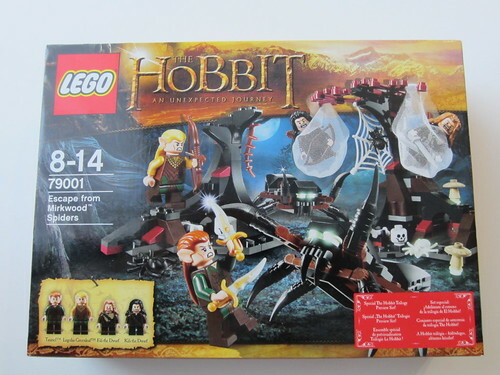 Includes 4 minifigures: Fili the Dwarf, Kili the Dwarf, Legolas Greenleaf and Tauriel, all with assorted weapons. • Free the Dwarves from their cocoons with the tree tipping function! • Imprison a minifigure inside of each LEGO® cocoon element! • Collect Fili the Dwarf, Kili the Dwarf and Tauriel available only in this building set! I will preface this review by stating there may be spoilers from the Hobbit novel, as well as potentially from the movie trilogy. When it was announced The Hobbit duology was to be extended into a trilogy, obviously Lego's marketing plans were thrown into a bit of chaos. 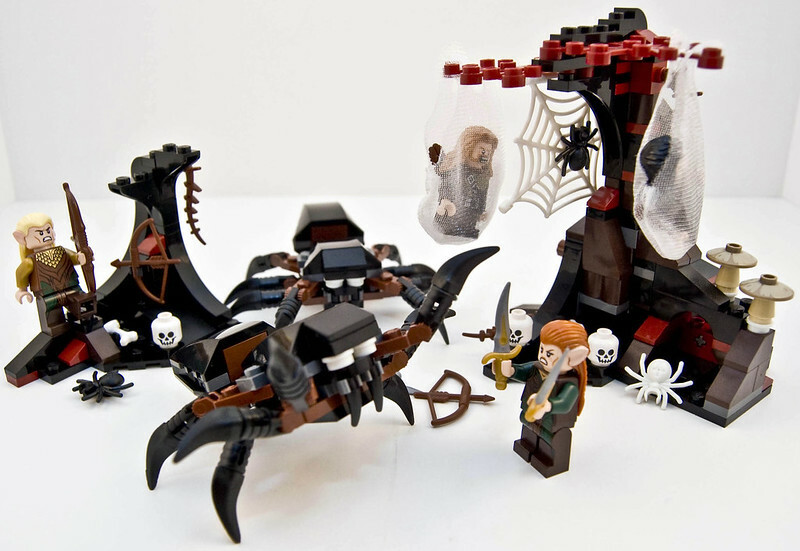 As such, the first wave of the Lego Hobbit theme contains two "Special Preview Sets"; 79001 Escape from Mirkwood Spiders and 79004 Barrel Escape. Looking over this set, the first impressions are that the minifigures are the driving force behind it. Consumers receive the elves Tauriel and Legolas (neither being in the Hobbit novel yet are placed into this trilogy) and the dwarves Fili and Kili. Yet there is also more value added in here, the spiders seemes reasonable, the set contains some glow in the dark elements, and of course there are the trees. Personally I would love Lego to make a bit more effort with their attempts at foilage. Sometimes it seems they are a mess of bricks thrown in for pad the price, which it seems they have done with this set. It certainly wouldn't take much to add a bit more detail to it. First let us have a look at the minifigures. All are currently exclusive to this set; however, there is great potential they will feature again when the Hobbit movies cover the Battle of the Five Armies. Hopefully as we see across other themes, Lego will give us variations of the characters to retain exclusivity. Legolas Greenleaf. Legolas has addition variations in the Lord of the Rings Lego theme. I would have liked Lego to give a bit more detail to Kili, to further distance his look from that of the Thorin minifigure. They do look similar with their dark features ad clothes, but are still distinguishable. The elvish headpieces are highly sought after and will allow builders more options in customising their elves, as well as having the outfit of a female elf warrior. There is plenty to offer with the minifigures alone! As for rare parts, there are a few gems hidden in this set. The majority of pieces are easily obtainable, though the cocoon netting is only currently available in this set. Also available is this gorgeous elvish dagger! In fact, Lego gives us quite a nice range of weapons in this small set, with two bows, 1 longbow, 2 quivers, 2 swords and 3 elvish daggers. As we can see, Lego have included some nice pieces into this set which will continue to interest collectors for a long time. The set is a very straight forward build with the only difficulty potentially arising are mistaking the colours in the instructions, as it is a relatively dark set. The glow in the dark elements are fun but don't really lend itself to playing with Lego in a darkened environment to have any real effect. The set does contain some other small playability features though. Firstly, we should be grateful this set does not contain any flick-fire missiles, instead of flick-fire spiders! This is actually a neat little design and does make you ponder how this scene will play out in the movies. Secondly, the tree "breaks" freeing the dwarves to continue with their battle. It is actually a cute little addition that children will enjoy. The spiders are also able to be placed in various fighting poses and scenes, enhancing the playability features in this set. Combine these with the extra weapons and cocoons, there is actually a bit here for everyone. Going by the sold listings, the three minifigures total $19.75, with the current asking prices totalling $21.81. If we consider that the full retail price is $24.99, this is a fantastic return already on a set still easily available with current values returning nearly 80% of the set's value. 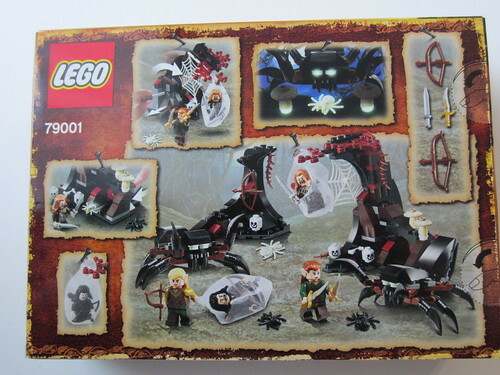 As we can see, compared to these others sets the 79001 Escape from Mirkwood Spiders set is overpriced. Key elements are introduced in each set with the detail on the minifigures, but the cost does seem to have blown out a bit with this one. There are some unique features and the glow in the dark elements included, however the set really should have been a little cheaper. That being said, 10c per piece is a standard benchmark in the current market. The Hobbit novel was released in 1937 and is the fourth highest selling novel in history with over 100 million copies estimated to have been sold. The Lord of the Rings novel was released in three volumes from 29 July 1954 to 20 October 1955 and is the second highest selling novel in history with an estimated 150 million copies sold. The initial Hobbit: An Unexpected Journey film grossed over $1 billion in box office sales, with two more instalments coming. The Lord of the Rings movies combined for nearly $3 billion in box office receipts. The Lord of the Rings theme currently has a 4.91% CAGR, with the Hobbit theme coming under this banner. Considering it is a brand new theme with few retired sets and a raft of discounts now available, that is actually a decent return. One only has to take a glance at popular fantasy themes such as Harry Potter to see that this set has a very bright future. This set was released in November 2012 and is still currently available. At $29.99 it is a touch overpriced, available in many stores and easily accessible to all consumers. The front cover art is well laid out, showing the features of the set with the highlight being on the minifigures (and those awesome elvish daggers!). It also cleverly highlights the glow in the dark elements as well as giving the spiders their share of space. It is very well laid out. The back cover is also neatly designed, with each playbility feature surrounded by a map styled border. Everything that I have detailed in this review has been laid out nicely on this setup. The box itself is thicker than necessary and there is a fair amount of space remaining in the bag. That being said the edges on the box are very sturdy so it would take some decent pressure to crush those. Thus far as a set, it isn't performing that well and selling below retail. In fact, I expect this set to drop further as stores clear it out cheaper freeing up space for new stock, considering the set has only been available for 10 months. That being said, the cheaper price the better the price per piece ratio. We have already seen earlier how much of the set's value is contained with the four minifigures, so a cheaper price point only makes it more attractive. How this set goes in the future will depend on how exclusive the minifigures remain. One would expect all four characters to feature heavily in the epic finale planned, so we could potentially see them in more sets. Lego have shown recently that they aim to make minifigures more exclusive by creating different variations throughout themes, so one can only hope they continue with this. I think it is important to look at the 4738 Hagrid's Hut with this set. It retired in November 2012, and now to date has risen 79.62% with a CAGR of 21.56%. It does give hope that this set can give a very nice return in the near future. In the long term though, this set will do well. 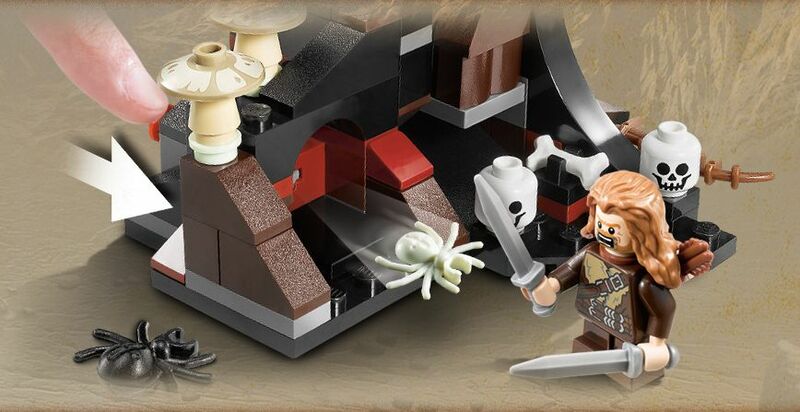 Elf pieces continue to be highly sought after, and the Hobbit theme is giving Lego fans opportunities to pick various pieces up. The Middle Earth stories are some of the most popular in history with millions of fans worldwide. The movies only enhance the recognition of the theme. This set looks tidy and can be made into a nice little display set. Obviously with more dwarves, spiders and elves it would have a greater impact, but at this stage we have no real idea how the scene will play out in the movie. The glow in the dark elements add to the design and the elf minifigures in particular stand out. That being said, with such a small set it isn't necessarily one that will command attention. As the Hobbit movies roll out over the next two Christmas periods, worldwide exposure to the stories of Middle Earth continues to grow. Lego continue to impress with the level of detail now on minifigures, and the ones included in this set are no exception. Combine these two features, and a lower price than other sets and you have something that appeals to most Lego consumers. The set is slightly overpriced compared to others, but also contains a handful of glow in the dark elements to add to the set. Those completists currently seeking the entire collection of Thorin's company will require these minifigures in their collection. How the set increases in value over time will depend on how exclusive Lego make the minifigures, but multiple variations never hurt. Find this set at a solid discount and you will make your money back instantly with the minifigures. This can only bode well for the future.